A headline selection of rare Scotch Malt Whisky Society bottlings, including a Glenfarclas from their very first single cask release, are among the whiskies being auctioned off today at Mc Tear’s auction house in Glasgow. Since 1983 the Scotch Malt Whisky Society has offered members access to unique bottling from single casks of whisky. In recent years these expressions of whisky from Scotland and further afield have gained a wider following in the collecting world and are now increasingly sought after. 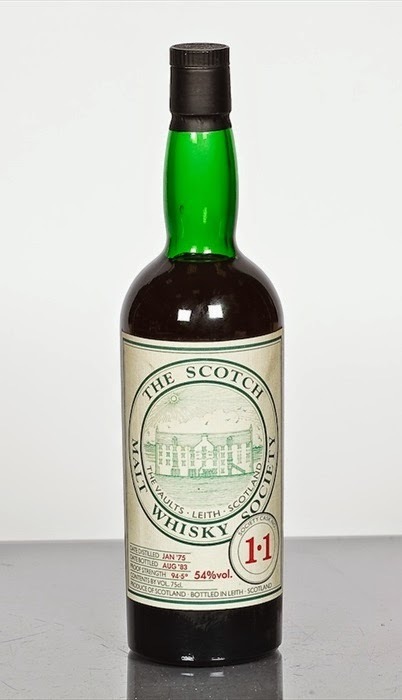 Today’s auction will include first society cask bottlings from iconic distilleries including: SMWS 21.1 (Glenglassaugh) - SMWS 41.1 (Dailuaine) - SMWS 125.1 (Glenmorangie) - SMWS G5.1 (Invergordon) and SMWS 1.1 (Glenfarclas) the societies first ever bottling. Also featured in the auction are foreign single cask bottles: SMWS 119.1 (Yamazaki) SMWS 120.1 (Hakusu) SMWS 116.1 (Nikka) and SMWS 128.1 from Welsh distillery Penderyn. In addition to the SMWS bottlings a number of old favourites make welcome reappearances; Macallan 1946, Bowmore 1957, Kinclaith 1969 Signatory Vintage, along with several Port Ellen’s, a Talisker 8 Year Old and rare bottling’s of Redbreast. The auction starts today at 10:30am and will include a total of 427 lots.